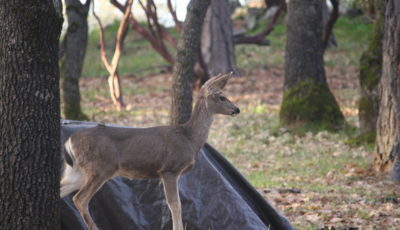 Spring is in the air and the deer seem to know it. 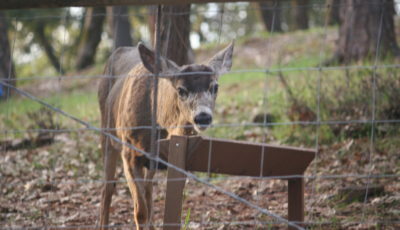 We got to know “our” black tailed deer during the past year. 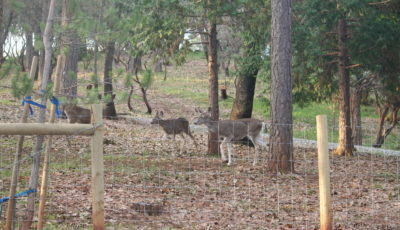 We enjoyed their visits each morning and evening as we became accustomed to mountain life and our new surroundings. 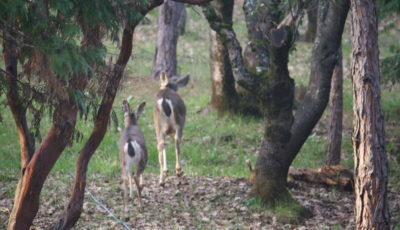 We got to know the regulars – three bucks we named Scratcher, Kicker, and Chester – and the occasional doe who would follow behind in an appropriate amount of distance based on pecking order. 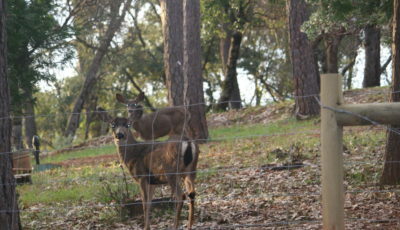 In early summer we gushed when a spotted fawn accompanied a doe and the three bucks down for breakfast. We watched in awe as the bucks antlers grew and made these mature males look all the more powerful and glorious. We mourned the loss of Gimpy, the buck with a broken leg, who we found him dead on our property in early Fall not far from our driveway. He was an older buck who hobbled along on a three legs for at least a few years (per the previous property owners) and apparently died of old age and not because of his injury that he seemed to manage relatively well given the circumstances. In Fall hunting season is followed by rutting which drive the deer away from the Golden K with only an occasional visit by a stray buck. The mostly absence of deer throughout Winter was striking and I missed them. I wondered where they went, how they were doing, and if they would return back to the Golden K.
And then they did. Last weekend our black tailed beauties returned home in full force. There were antler-less bucks with foreheads sporting only sockets where their magnificent antlers once were but fell off in the last month or so. There were does, skinny and hungry and presumably preparing for birth later this spring or early summer. And there were the yearlings. Small and skinny but healthy “kids” who survived the winter when the majority of their peers have perished. Fawn mortality rate runs between 50% and 70%. So as Spring begins friends of the Golden K have returned much to our joy and anticipation. Anticipation of more fawns, more grand buck antlers, and continued health and prosperity that all creatures- man or beast – hope to experience and be blessed upon by Mother Nature. It’s been almost a year since we arrived at the Golden K. The return of the black Tailed have Deer reinforced the circle of life and most notably my romantic perspective of life at 3100 feet. They are so fascinating to watch and reinforce the privilege of living so close to Mother Nature’s treasures. 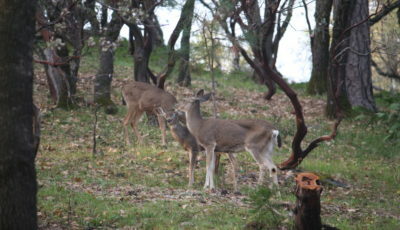 Enjoy the deer watching this spring, summer and fall.